A quick glance at the new reality TV show “Beverly Hills Nannies” will tell you that taking care of someone's children is not a walk in the park. For someone who is looking to save on rent, expand their work history, or who really enjoys working with kids, however, becoming a live-in caregiver for children definitely has some benefits. In addition to a sleeping room, meals with the family, and occasional access to transportation, some of the better nanny jobs include an extra ticket to the next family vacation. Not all nannies have a live-in situation, but for those that do, the decent weekly salary helps make it an attractive option for college-aged adults. On the other end of the age spectrum is the role of care-giving for grown-ups. Whether you are providing services for an elderly client, an adult with special medical needs, or someone with developmental disabilities, many of these jobs will let you stay on the premises through your resting hours. Not all jobs that offer room and board will pay you additionally during your sleep time, and those that do usually pay at a discounted rate. Some jobs at group homes, for example, allow you to eat with the clients, and in some cases, catch some shut eye when everyone else goes to bed. Working in an agricultural setting is hard work; so much so, in fact, that many large farming operations rely on their employees to be available 24/7. 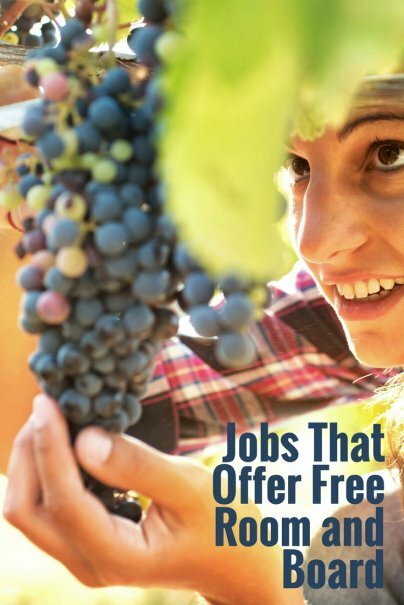 Someone with the right skills and an excellent work ethic could get a job at a farm, dairy, or ranch for decent pay and the benefit of living in a farm-owned residence. While usually not as posh as many farm-owner homes, these arrangements do allow for you to be close to your work (no commute) with no extra rent check to pay. The tourism niche is so broad that it literally encompasses about every job you can imagine. Cooks, waitstaff, massage therapists, medical professionals, personal trainers, housekeepers, retail associates, and management are just a few of the jobs available at lodges, cruise ships, and vacation destinations worldwide. Many of the positions include completely free room and board for the duration of the season; others offer deeply discounted or subsidized housing. While not always comfy, serving your country does take care of the how, when, and where of your living arrangements. Many will not be up to the challenge of sleeping in a cramped sub or taking on the tent life that overseas duty can entail; some military families have thrived in base housing, however, even in spite of the modest accommodations. As the population of our country ages and people start thinking outside of normal employment traditions to get the services they need, room and board arrangements are likely to get even more common. Be sure to use discretion when applying for any job that offers it, however; sharing your abode with your employer is a personal decision — not to be taken lightly. I worked as an orientation leader for my college one summer, and that provided free room and board. It was great in many ways (my college's town was beautiful in the summer), but could be super draining when the students were there -- we'd work 18+ hour days. If you are willing to relocate to Western PA, Eastern OH, or North Dakota you can start as an Oil and Gas Landman or even Title Examiner. They will pay for you to live in a hotel, pay $30/day for meals, and anywhere from $175-$225/day to start. For a single person this HAS to be the easiest way to save thousands and thousands of dollars a month with a very low entry requirements. They are in need! What companies are you referring to in these states? What are their names please? How to apply for this job? Any contact information? How would Courthouse Title Examiner get a free room and board?? what exactly does a oil and gas landman do?specifically what are the qualifications on entry level needed? I'm interested in these positions. What kind of experience do you need? I am interested in the location in eastern Ohio. Can you let me know the steps I need to take to apply for this position and who to contact. I live in Eastern Oh/Western PA area (Steubenville) and don't see anything with "Free" housing here even with all the fracking going on. Do you know what the entry requirements are? Young man needs change of life job. Just a clarification. A parsonage isn't exactly "free" housing. A pastor pays social security on what the government deems is it's fair market value (commonly 40% of the pastor's cash salary). Since a pastor is "self employed" for social security purposes that's 15.3%. Some states and communities also consider housing as income and tax at their respective rates. However, it is not considered income on federal taxes. When I was abroad, I met Canadian students who were living in Madrid and working as nanny's for two different families. While they were both provided with living accommodations, one was much happier than the other. This is a great way to make money as well as get a free room/food/vacations (as many families who hire live-in nannies are very wealthy) but if the children are brats, or the family makes you feel as if you are only there to serve them, it could mean a pretty miserable time. Where I rented a storage unit (a national company) they have a couple with nice living quarters adjacent to the office. Could be worth investigating. You missed another big one - working on a touring show. While most jobs in that industry are pretty specialized (from the singers, musicians and actors to the lights, sound and automation technicians) there are also several jobs that are more mainstream. For instance, stage crew on large shows usually come in with carpentry or painting experience, but not necessarily theater experience. Some shows employ bus drivers, physical therapists and accountants to travel with them as well. And there's always management. Very large shows requires people who are adept with paperwork for licenses and all the other headaches that go along with a performances. Some shows even have chiropractors or masseuses traveling with them. Along that same vein, I work for the circus right now and live rent free on the train and we employ all sorts of different jobs for our little traveling city, right down to teachers and nursery school workers. what are the California laws about trading a place to stay for services? Isn't there a payment requirement of minimum wage and then you give that (back) to the provider of room? Road crews can make good money wage plus per diem. I know someone who fell into that laying tar where local companies would try to pay locals minimum or less to those who would accept the under the table wages. It just depends on how the company is run and managed. He got it through word of mouth. He thought the skill was easy to learn but very physical and tedious but the pay was great. A high school classmate works for an oil company but it's 16 hr days and all in all he's a pretty reclusive person on the best of days, so the isolation does not get to him as he usually has access to internet and is able to drive a long way probably over fifty miles once a week to get groceries. He does have his engineering degree but this lifestyle suits him.